Not only are FamilyTreeDNA sponsoring this years DNA Lectures (as they have done for the past two years), but they are also offering specially low prices for their DNA tests at Back to Our Past And for anyone who swabs at the event, you won't need to pay shipping costs either (usually 8.85 euro), so it is a double saving. FTDNA are also offering a 15% discount off any upgrade, so if you are thinking of upgrading from Y-DNA-37 to Y-DNA-67, now would be a perfect chance to do so. *euro prices are approximate due to fluctuating exchange rates. Customers will be charged in US dollars. 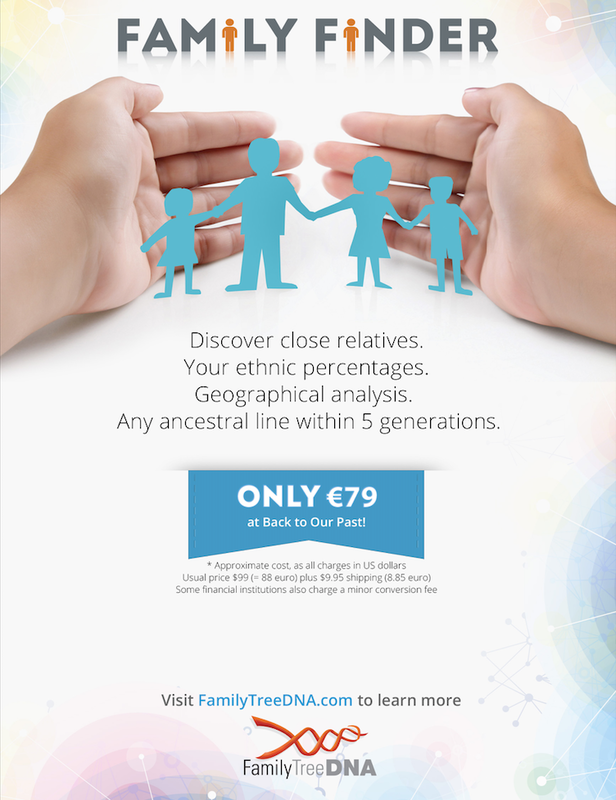 Currently the cheapest atDNA test on the market? I wish they could find a way to extend this offer to those of Irish descent who can't be at the gathering! I really want to do the mtDNA test, but I am wavering over the $199.... if it were $169, I would not hesitate (even if paying shipping).